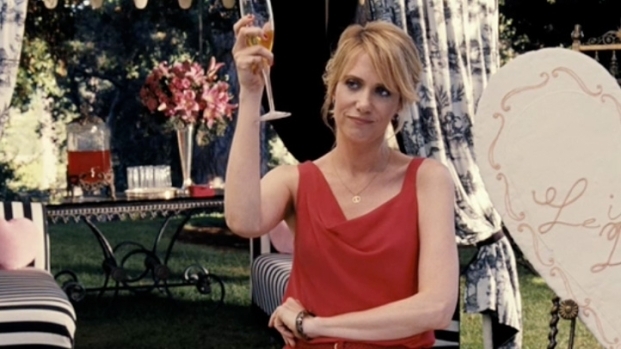 Kristen Wiig: "We Just Wanted to Write a Funny Movie With Ladies in it"
Is it possible a kind-hearted comedienne from upstate New York has, along with her equally funny friends, solved a puzzle that has eluded social scientists and big studio producers for decades? Has Kristen Wiig inadvertently discovered the perfect formula that makes a ribald, big ticket comedy equally hysterical for both men and women? If so, it couldn't have come from a more humble source. As her co-star Wendi McLendon-Covey describes her, there is "not one drop of diva" in Wiig. Around the set, she made no particular demands for star treatment and perks. Instead, she made a point to remember everyone's name, including the shuttle bus driver. "She makes everybody feel special," her co-star says emphatically. Which is nice, because she's about to become kind of a big deal around here. Her new film "Bridesmaids," which stars Wiig, fellow "Saturday Night Live" alum Maya Rudolph and Melissa McCarthy ("Mike & Molly"), along with McLendon-Covey ("Reno 911") and Rose Byrne ("Get Him to the Greek"), is about two best friends suddenly traveling on very different life trajectories. Wiig's Annie is enduring a rough patch, her dessert bakery business having recently failed, her love life a smattering of one-night stands, and forced to live with a decidedly odd and unsavory British brother and sister as her roommates in a small Milwaukee apartment; her friend, Lillian (Rudolph), however, seems on a roll, finally getting engaged to her longtime boyfriend, who's rich, fabulously successful and living in a tony section of Chicago. Naturally, Lillian wants her BFF to handle all the Maid-of-Honor duties, and that is where things begin to go horribly -- hilariously -- wrong. According to Wiig, though, she and writing partner Annie Mumolo weren't trying for anything revolutionary. "We didn’t intend to make any big statements with the movie," she says. "We weren’t trying to make a certain kind of movie or fill any holes of movies that haven’t been made: We just wanted to write a funny movie with a lot of ladies in it." One major reason the film succeeds as well as it does is it doesn't feel as if it were made by committee. Wiig believes there's a definite reason for that: The presence of Judd Apatow as its producer. "The studio was really great about letting us shoot a lot of different ways and Judd was really the reason for that," says the first time feature screenwriter. As for the funny, according to the women, it helped a lot to have former comedians such as Apatow and director Paul Feig ("Arrested Development") on board to bounce ideas off. " I think it was extremely collaborative," Wiig says, "Judd and Paul were really good about pushing us to just keep thinking, keep writing. And, ‘yeah we have a scene and it’s really funny…but what if this happened? What if this person said this? Or what if this character was there also?'" Conversely, according to McLendon-Covey, it worked the other way as well: "To his and Paul’s credit, they listened to Kristen and Annie. Because I think [Apatow] had a preconceived notion about how girls act when they’re together. And when there’s six girls telling you, ‘No, that’s not what happens -- This is how it happens.’ He finally said, ‘Oh, if that’s the truth, that’s how we should approach things.’"
"This is the face of comedy," McLendon-Covey says, framing Wiig's smiling face with her hands, "This is the face of America."